Could you adapt forms I have created myself using HTML coding? I have some long and complicated forms for my business which I created myself using HTML codes that I found on Google. These forms are not elegant, but they are what I want. Unfortunately however, they are too long and complicated for browsers to cope with, so they cannot be sent by the click of a "submit" button. If there is a way you could convert either my forms or my coding into a professional and compact end product that actually works, I would be prepared to pay a reasonable fee. These forms involve a lot of drop-down menus which take up much less space than radio buttons. I haven't seen drop-down menus in your form-builder, otherwise I might have tried it myself. The main problem is not being able to send them with one click because they are too long. I have found a practical way round this, but I fear that my solution would not be simple enough or fast enough for some of the people I hope will visit my website, and it might put them off. I will forward your request to someone who might deal with your bespoke order. 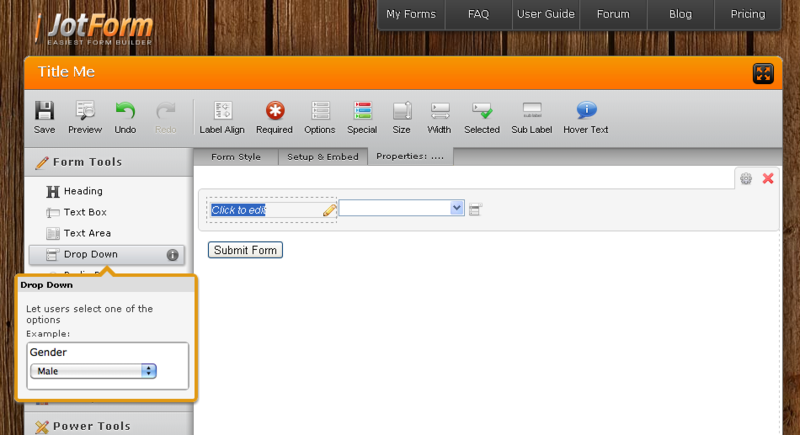 Incidentally, just FYI we do have dropdown fields which are found in the "Form Tools" menu of the form builder/editor. Be sure to let us know if there is anything else related to our forms we may do for you. Our team will gladly assist you. Your glowing tribute of our product is much appreciated, Andrew. It's always very encouraging to our team to get such feedback.